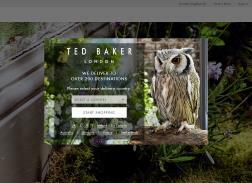 Ted Baker is an online store offers high quality and fashionable clothing such as shirts, tops, t-shirts, jackets, coats, jeans, skirts, dresses, shorts and knitwear for both men and women. The site also offers accessories like bags, shoes, wallets, belts, scarves, cufflinks, hats, socks, watches, sunglasses and iPad cases. Get up to 50% off Ted’s signature prints. Get 15% off for Students when you register with Student Beans. Valid for Students currently Studying in the UK, US, France or Germany; and is valid on full price items at Ted Baker only. Ted’s Spring Shopping Event! Get 20% off Ted’s Spring 17 Collection. Get 30% off Love Ted. Get Up to 50% off selected lines – final reductions. 25% Off Online and In-store. Valid 9/27-9/30. Get involved with the Black Friday fun at Ted Baker. Enjoy up to 50% off online and in-store with everything from suave suiting to party dress perfection, youre sure to find something stylish to suit you. Get up to 50% off Ted’s standout shoes.